This facility was given a 5 star review from Na. See what was written below. The AdCare name represents innovation, quality and cost efficiency in alcohol and drug treatment. AdCare’s integrated system of care offers a nationally-recognized hospital facility in Worcester, Massachusetts; an inpatient treatment center in North Kingstown, Rhode Island; and a network of outpatient offices conveniently located throughout Massachusetts and Rhode Island. AdCare, which is owned and operated by American Addiction Centers (AAC), embraces a philosophy of quality-driven, patient-centered programs that are also relevant to the challenges of today’s healthcare environment. AdCare’s continuum of treatment levels and modalities enables us to match the needs of the patient with the most appropriate level and cost of care. We believe that addiction is a disease that affects not only the individual, but his or her family as well. Successful treatment requires placement at the appropriate level of care and involvement of the family throughout the treatment continuum. This treatment philosophy has allowed us to advocate for the patient while remaining responsive to the interests of commercial healthcare companies, Medicare, and other insurers. The staff here are amazing. Everyday they were kind, sincere and caring. I don’t know how you managed to pick such a winning team, but you couldn’t have done better. The care I received was outstanding and the staff were so knowledgable. I would recomment AdCare to anyone! Jeffrey W. Hillis, J.D., M.B.A.
Jeffrey Hillis joined AdCare Hospital as Vice President of Administration in 2002. He became President in 2014 and President and CEO in 2018. Mr. Hillis continues to oversee hospital operations, including The Joint Commission, Centers for Medicare and Medicaid Services (CMS), Massachusetts Department of Public Health, and Drug Enforcement Administration (DEA) survey processes for AdCare Hospital. He is a frequent presenter at conferences on issues related to substance use disorder treatment and meets regularly with legislative leaders, executive branch leaders, and representatives from managed care organizations to discuss issues surrounding substance use disorder treatment, managed care, finance, legal issues, and employment. Dr. Patrice M. Muchowski, Sr. Vice President of Clinical Services since 2018, and Vice President of Clinical Services since 1988, is also an associate in the University of Massachusetts Medical School’s Department of Psychiatry and a clinical instructor in Harvard University’s Department of Psychology. Dr. Muchowski holds a doctor of science degree and a master’s of science degree from Boston University, in addition to the following professional certifications: National Certified Addiction Counselor (NAADAC), Certified Alcohol and Drug Abuse Counselor (CADAC), Master Addictions Counselor (MAC), and Proficiency in the Treatment of Alcohol and other Psychoactive Substance Use Disorders (APA). From 2006 to 2017, Susan Hillis served as Treatment Director. Prior leadership positions include Director of Inpatient Rehabilitation Services and Director of AdCare Outpatient Services’ offices in Worcester and Boston, Massachusetts. Ms. Hillis received the Massachusetts Association of Alcohol and Drug Abuse Counselors (MAADAC) 2015 Robert Logue President’s Award for her support of membership, as well as her dedication to substance use treatment, recovery, and professional credentialing in Massachusetts. A former Board Member and Chair of the Massachusetts Professional Recovery System (MPRS), she currently oversees clinical practicums for students in the Addiction Counselor Education (ACE) Program at AdCare, and provides clinical supervision for students in MSW Programs at a number of schools. Ms. Hillis presents frequently on substance-use related topics locally, regionally, and nationally. She holds a master’s degree in social work from Boston College, and an undergraduate degree in music therapy from Anna Maria College in Paxton, MA. Dr. Alhabbal is certified by the American Board of Addiction Medicine (ABAM) and the American Board of Family Medicine (ABFM), as well as a member of the American Society of Addiction Medicine (ASAM) and the American Academy of Family Physicians (AAFP). A graduate of the Damascus University Medical School in Damascus, Syria, Dr. Alhabbal completed his Family Medicine Residency at the University of Massachusetts Medical School in Worcester, Massachusetts, where he is an Assistant Professor in the Department of Family Medicine, Hospitalist Division. Dr. Alhabbal is also a family practitioner at 200 Lincoln Street Primary Care in Worcester, Massachusetts. Fig. 1 - Rehabs.com surveyed over 26 thousand alumni, their loved ones, and staff of treatment facilities to reveal how addiction treatment recipients feel about the quality of care they receive. 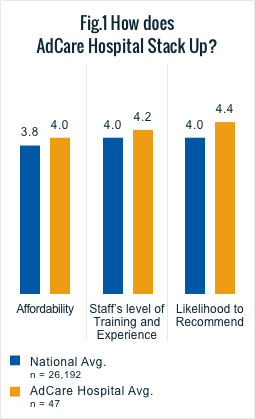 Respondents associated with AdCare Hospital report, on average, superior ratings for aspects of care such as the facility's affordability in comparison with its competitors, the staff's level of training and experience, and the likelihood that they would recommend AdCare Hospital to a loved on in need of treatment. AdCare Hospital was founded in 1984 in response to demand for alcohol and drug treatment. Located just off Interstate 290, this Worcester branch of AdCare Hospital is one of 33 (9.3 percent) in the state that offers short-term inpatient rehab for adult men and women, along with outpatient programs (OP). It is also one of the only 28 (7.9 percent) treatment centers in the state where medically monitored detox services are available. Following a merger in 2018, AdCare Hospital became part of American Addiction Centers. All clients receive a comprehensive medical history review, physical screening, and bio-behavioral assessment upon admission. During detox, clients receive 24-hour monitoring and daily medical rounds. Since a stay here is intended only as a short-term measure, discharge planning begins when a resident is admitted. According to the facility’s website, there are two types of inpatient treatment: one that treats patients who have co-occurring medical or psychiatric conditions, and another for individuals who either have no co-existing mental health conditions, or if they do, are more stable. Treatment is individualized in both programs and consists of individual and group therapy, 12-step meetings, relapse prevention workshops, classes on self-help skills, educational sessions, and family education and counseling. Outpatient services include individual, group, and family therapy, an intensive outpatient program (IOP) with both evening and daytime options, family support services, gender-specific groups, parenting groups, groups for young adults, and more. A family and friends meeting is held every fourth Wednesday of the month. The treatment team includes physicians* nurses, nurse practitioners, counselors, clinicians, and case managers. In the state of Massachusetts, 97.2 percent of all substance abuse treatment facilities have continuing education requirements for staff. The 38 individuals polled by Rehabs.com to date gave largely favorable ratings for the facility's staff. The 114-bed hospital-based facility has a clinical setting, which was generally satisfying to the 38 Rehabs.com survey respondents to date. Reviews from more than 20 former clients surveyed by Rehabs.com to date indicated mixed feedback for AdCare. Complaints included the need for more treatment time as well as the need for more beds. Concerned alum S.M.M. wrote: "Alcohol detox fine...the people on drugs were moved on to rehab way to early in their detox stage and subsequently, MANY of them left AMA because they had to use." Complaints also revolved around a lack of treatment options aside from 12-step meetings. Former client S.J. wrote: "Should have more books and other things to take the patients minds off the struggle," and another anonymous alum, despite praising the "great staff," listed "no extra things to do outside of treatment" as a facility weakness. While alumni tended to approve of counseling options, they were somewhat critical of the facility's outside communication and visitor policies and reported a lack of holistic offerings. On the positive side, alumni polled on facility strengths typically cited the staff. “The care and consideration of the staff made me at ease and very comdfortable they are right there to help in anyway,” an anonymous alum shared in a representative positive review. Overall, the vast majority of alumni reported they'd strongly recommend the facility. On CiteHealth, the sole review to date was provided by a former client who awarded the program four out of five stars overall. "All in all a good experience during a tough time. Would recomend to others. Results are happening with thanks to Ad/Care," the anonymous reviewer wrote. AdCare fared somewhat better with loves ones. Of the 14 friends and family surveyed by Rehabs.com to date regarding family participation, the majority were quite pleased. Praise for the center's staff and affordability were both common, and one anonymous loved one wrote, "I was impressed by the caring nature and knowledge of the entire staff." In general, echoing alumni opinions, those surveyed on the metric agreed that they would strongly recommend treatment at this center. The only common overall complaint from friends and family was overcrowding. On Google reviews, the center has an average rating of 3.4 out of five stars from 24 reviewers, many of them dissatisfied loved ones. Some family members expressed concern that their loved ones were not properly cared for before discharged. According to the facility’s website, AdCare accepts most insurance plans, including Medicare, placing it amongst the 54.1 percent of treatment centers in the state that accepts Medicare. In addition, CiteHealth reports that AdCare accepts Medicaid, military, and state insurance as well. The 38 Rehabs.com survey respondents to date polled on the matter expressed satisfaction with the facility's costs. This was first time ever being through a detox for alcohol. I found every person there to be supportive, compassionate, and caring. It was 24 hour care around the clock. Everyone saw a Doctor every day who was also very kind, interested in how you were feeling and I never felt he rushed through seeing me every single morning. This was back in March, I am hoping never to have to do this again for my own sake, but if I did have to, this is where I would come. ML, we appreciate that you took the time to leave this review. Thank you for the positive words and recognition. We wish you all the best moving forward and encourage that you keep in touch. Thank you for leaving your feedback. We are sorry if there has been any miscommunication. We highly value communication and follow-up. Please know that your reviews is being considered and will be used for internal use. We hope all is well. I was not able to visit my loved one at this facility. The first time didn't help, the second time they had psychiatrists on staff and I was diagnosed bipolar and put on meds. The doctors and nurses were great, but the counselors were idiots. Some staff are decent, case worker on the other hand was awful, doesn't want to really help and do her job! She is not sincere about people in recovery! I'm not the first to say this! So be carful with your confidentiality with that woman! This facility is totally ineffective, my sister was discharged with some stupid treatment plan and did not succeed. She was obviously not fit to be released but this hospital only cares about profiting off of people with addiction problems. No one even notified our family that she was being released in such an unstable state. Adcare hospital is simply concerned about filling beds for insurance dollars. Dedication to the physical, spiritual and psychological aspects of addiction, detoxification and rehabilitation along with a good record of aftercare programs. All of the hospitals inpatient programs offer free transportation to and from the facility from all over the state of MA. Decent meals. Almost no real treatment. Mostly AA type groups. No exercise options, no going outside for air, no real treatment/education other than AA, only phone use was a payphone that cost 50¢ for 2 minutes and usually took the quarters but didn't work. I think they should hire on more counselors. for over growing in patients. Over whelming mass of patients. Despite that, the staff is well trained and experienced. I wasn't there. My friend went to them. The staff was very nice. It wasn't very clean. I felt somewhat like I was in prison. we could only use the phone once a day for 5 minutes at a certain time of day. They have a great outpatient program. It was great it was effective and i was cured all in 30 days. Yeah. Daily meetings are effective,and smoking policy is fair. Cleanliness wasn't great,some of staff was only book qualified not experienced, food was unappealing. Had a very hard time getting a bed the first time i went,some of the staff was very effective.where others were not. also insurance should cover a longer stay for effective treatment. over all my experience here was effective. My son was terribly mistreated at this specific facility (Worcester, MA AdCare.) There was no where near enough staff to ensure security. One of the counselors asked VERY personal questions which were not relevant to his treatment- very unprofessional. The facility was also incredibly dirty and lacked meals catering to those individuals with food allergies. I will NEVER recommend this facility to friends or family and will make sure my son receives proper treatment elsewhere. Great staff lot of griups and support for further treatment. Phone use was a downfall. I had a good stay staff was great I enjoyed the groups and felt they got to know us all on an individual basis. Strengths: effectiveness. Weaknesses: cleanliness, activities, food. It's good for it's price. respeaking the people. food could be better. the group treatment was the best. they were helpful in all aspects of treatment. the staff were very helpful , and it was close to home. They have both inpatient and outpatient treatment programs as well as programs for loved ones of those receiving treatment. However, it is very difficult to get into the program because it is so busy. This facility has very good programs to help people with addiction issues and they offer help to loved ones of those receiving treatment; however, it can be difficult to get into because it is so busy and beds are limited. Daily visits with doctors, lots of nurses on floor. Unprofessional counciling staff. Works with insurance, quick to admit me, definitely saved my life. It is a great facility, the rooms are clean, the staff are nice and they help you find further treatment. The education groups and outside commitment are great but the stay is not long enough. They did let you use the phone but didn't require any follow up meetings. The AA meetings were great but the counselors were not consistent. The food could be more nutritious and the portions could have been larger. Not enough night time staff. Addicts don't sleep much and that is when they most want to talk. If no one is available that's when their minds go crazy and they start hatching plans to leave. However, the aftercare planning was good. I was impressed by the caring nature and knowledge of the entire staff. However, the location was a downfall. The staff is very qualified and helps out. However, it is expensive. They group therapy was great. They helped me see the light. However, it was too crowded. They really seem to care and the therapy was good; however, the food was not good. It was a good and effective program. They pick up and drive home. Lack of beds...one has to call every morning to see if any are available. It was covered by all kinds of insurance including medicaid. They allow people back many times; after many trips, their program worked for me. It is a hospital. A downfall was that there was not enough one-on-one time. Professionals(police,lawyers, doctors) have negative things to say about this facility. Poor follow up with patients. They are organized and try hard at first. This place has alot of different treatment options. It is a clean, friend and non-institutionalized setting. However, they lacked organization. Great staff, most have been through treatment themselves. Great medical care as well as sobriety programs. Lots of aa commitments. Lots of information about programs outside of just aa that I knew nothing about. The staff taught me to be open, to connect with people who had what I wanted, which I never would have done if not for them. This may sound strange but the food was excellent and was available 24/7. That made a difference to me. There were a few situations that got out of control that were handled with so much compassion and professionalism. It really showed me so much about recovery when I was sure I would die somewhere drunk. I actually had accepted that as a perfect scenario, I couldn't imagine life without alcohol. They changed my imagination to something positive. I needed that to care enough to do the hard work of getting sober and staying sober. I was so focused on finding my own sober path and all the options that they made me aware of that I didn't find a single weakness with the facility or the staff. The staff seemed very reassuring and communicative with the family, which helped me from feeling so helpless and made me feel more involved in his recovery. Should have more books and other things to take the patients minds Dual diagnosis care for addicts also suffering from mental illness issues was a positive aspect. It saved my life. Only downfall was that they did not have enough leisure activities. Great place. Great staff. This place saved my life!!!!! However, there were not enough activities. They provide transportation for in/out patient treatment. They also provide dual diagnoses treatment. They are open during holidays for persons with no family for comforting. I didn't have much one/one counseling. When I was crying and afraid not knowing whether or not to go to a residential program that was over 1hr away The staff was not at all comforting or assuring. If it were not for my child I would not have gone. Works w a wide diversity of backgrounds. An intensive treatment with well trained staff. However, it does not offer long term stay for treatment. Filling the day with informative classes while touching upon many aspects of addiction was great. However they lacked structured extracurricular activities. Went into this rehab scared to death about losing my nest friend booze. Adcare had an amazing staff that believes in their mission and carries their education on to each individual. They offer extra effort and try their best to assist each individual based on their need. Great staff, most have been through treatment themselves. Great medical care as well as sobriety programs. Lots of aa commitments. There were no extra things to do outside of treatment. Discharged while suffering from depression. I almost died after being discharged. I am still sober after leaving this facility over 6 years ago. I am in the fellowship of AA. Although my personal opinion is that there needs to be more one on one with individual counseling and group counseling being more frequent with playacting. There should be extracurricular activities offered like exercise, crafts, etc. But as a sponsor to individuals in other facilities, I feel that this facility (Adcare) is highly recommended by me. Success depends on the level of motivation of the individual. It would have to be very high. The staff was well trained, respectful and supportive. However, I was displeased with the holistic offerings. I recommend 28 days for detox and rehab. It helped me to understand and learn about my addiction. It is a hospital setting and it did frighten a little in the beginning. The Adcare Worcester staff (case managers and workers) are horrible and provide little care to their clients. My husband went there for help with his alcoholism. He went to the inpatient treatment facility for approx. 4-5 day stay. He had already lined up a post detox bed at another facility on his own. However staff failed to fax the necessary documents to the treatment facility for admissions. Even when my husband attempted to self advocate the staff at Adcare gave him the run around, told him they faxed it and failed to do so. Nurses and counselors stayed on facebook and other social media sites instead of providing services to patients. Even when I, a family member, concerned about treatment,contacted them, they were not willing to help. I was also lied to. I was told that the information would be faxed, however it never was. When i contacted the post detox program and spoke to their intake department they continued to tell me they were just waiting on Adcare to provide the paperwork and the bed would be held. However Adcare never sent it over. It may have not been the best at the time but when you are getting help from the state you know you go where they want you to. I hear it has changed since I was there. Whatever kind of rehab it was from what I learned it managed to keep me sober 28 years and bring up twins who are 31. IOP, personal Counsel and aftercare Groups @ Adcare near my home in western mass. Alcohol detox fine...the people on drugs were moved on to rehab way too early in their detox stage and subsequently, MANY of them left AMA because they had to use....I blame INSURANCE COMPANIES for not being realistic. The clinicians were very weak. Wrote up a report with inaccurate information with incorrect dates throughout. The therapy before exiting was a joke. Clinician called me by the wrong name. If you want a religious experience that won't stop you from drinking then this is the place for you. I've been in ADCARE four times and it never helped at all.